Russell L. (Rusty) Ganas Jr. He was one of Ware County High Schools best all round athletes in history. He lettered in four sports for the Gators, participating in football, basketball, baseball and track. Upon graduation from high school, he was awarded a scholarship to the University of South Carolina. The 1969 South Carolinian was invited to the Peach Bowl and culminating his college career, he was selected to play in and was most valuable defensive player. He played for the Baltimore Colts in the National Football League for 11/2 years and for the Minnesota Vikings for two months. He got his first teaching and coaching job at Bacon County High School as assistant varsity football and baseball coach. Rusty then joined the World Football League with the Philadelphia Bell and after observing the working of the organization, he decided to retire from playing football. He joined the Coffee High staff in 1974 as football defensive coordinator and head baseball coach. In 1976, the Coffee eleven went 10-0 losing to Ware County in the playoffs. His baseball teams at Coffee won the regional title two out of three years. In 1977, he gave up the baseball post to become the girls basketball coach at Coffee. 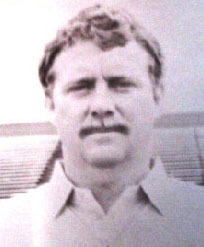 In 1979, he accepted the post of defensive coordinator at Waycross as well as the baseball coach. While at Waycross, Bulldog teams won 66, lost 14 and tied one, winning the state championship in 1981, capturing three regional and five sub-regional crowns. The Bulldogs were in the playoffs each year but one while Ganas coached there. In 1980, the Bulldog baseball team won the sub-region crown. Ganas was named athletic director and head football coach at Ware County High School in 1986. He gave up the head coaching job in 1993 when Waycross and Ware County consolidated but continued as Athletic Director until 2008. He is the son of Mr. and Mrs. R. L. Ganas, Sr. and is married to the former Teresa Tapley. They have two children, Garrett and Hannah.